Allyson - "In a time where our country struggles with our leadership I found the love for the recently deceased King Rama IX amazing." Thailand’s King Bhumibol Adulyadej (known to the people as King Rama the Ninth) died at age 88, ending seven decades on the throne during which he became a unifying father figure and rare source of stability in a country that has weathered more than a dozen coups since he came to power in 1946 at 18 years old. He died on October 13th, 2016 and the country is in a 1 year period of mourning. 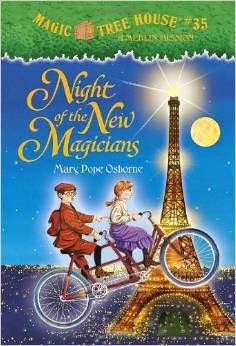 I (Avis) equate the love of this people for the king similar to England's love of Diana...the people's princess. King Rama IX was definitely the people's King. In fact our guides referred to him as their father...and nor political where the prime minister is the political arm, but the King is one of his consultants. King Rama IX is loved because he spent many of his early years spending all of his personal wealth on royal projects to make the lives of the Thai people better. Over time the government saw his effectiveness and as well funneled funds his way. He got opium growers to instead plant coffee and other product. He had hundreds of such projects enriching the lives of the people. The people mostly are wearing black for this year in mourning. I'd say 85% of the businesses and most homes have some sort of memorial whether a photo in the family room or a picture with flowers and candles, to massive banners and black and white ribbons. Ally was very moved seeing such a love of a leader where she as a child has had many questions about the leaders in her own country. 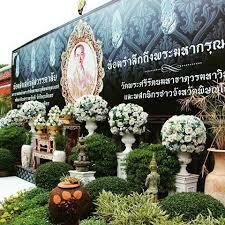 Here's an article more about King Rama IX. 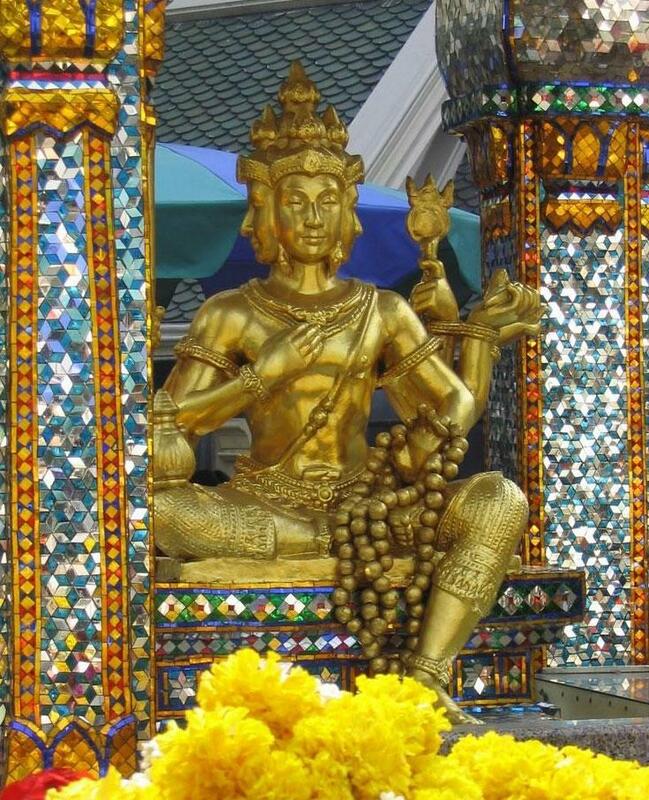 Alec - "I was most interested in the gods, especially the Hindu gods that are also acknowledged by Thai Buddhists." 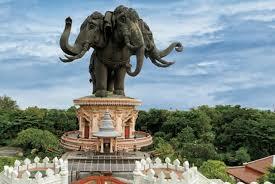 I was most interested in Erawan...the three headed elephant." 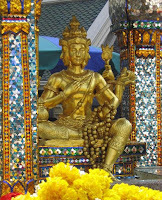 We learned in our travels and from our guides that Thai Buddhism is a mash-up of Buddhism, Hindu, and sometimes animism. Alec seemed most interested in the Hindu gods, especially Erawan, which has said to have 33 heads, but in sculpture he is generally depicted with 3 as 33 is just too difficult to depict. Here's more about Erawan. We also traveled to the Erawan Waterfall ...it is called that because at the uppermost of the 7 tiers it is said to have three stones similar to the 3 heads of Erawan. Avis - "I've struggled with religion all my life and have always been drawn to Buddhism and really enjoyed learning more about the Thai form with it's hints in Hindu and animism. Their strong belief in karma is a big pull for me as I am one who truly believes in what you put out there will come full circle back to you - good and bad." 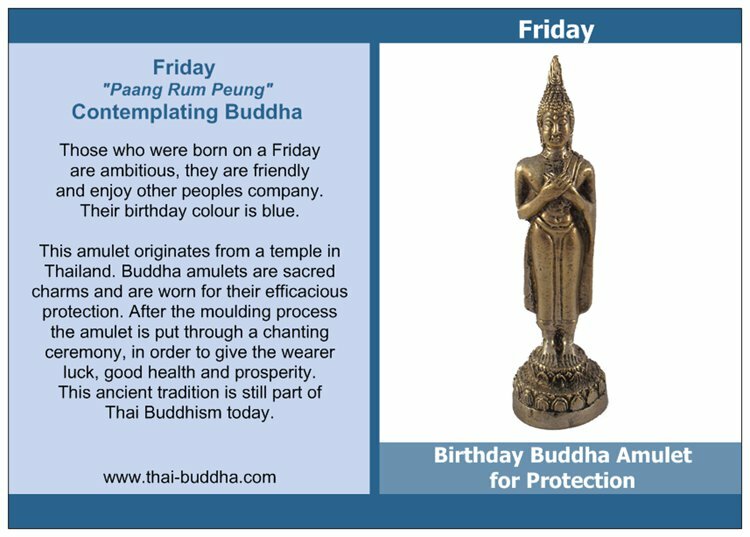 Here's some info on Thai Buddhism. I am excited to head to Cambodia next, the place where the ties to the Thai Hinduism originated. As with most religions I still found my struggles...the lack of women's roles in religious leadership. There are Buddhist nuns, but no monks (all be it we did here of one who's recently started a group here after returning from Sri Lanka). Ally and I always had to be covered and stand our distance from the monks. Only Andy and Alec were able to pour the water as the final step in our giving alms. Also we had a talk with Monk KK about the simple life Buddhism preaches and how the monks themselves live and the contradiction with the elaborate almost extravagant temples the people fund to build. Gold inlay, large, hand-painted, ...absolutely awe inspiring. All in all though Buddhism still feels most comfortable to me and the visit to Thailand only strengthened that familiarity. I was born on a Friday . Andy - I think the biggest thing I learned was a better understanding of the Thai people. Much of our impression of Thailand in the west is either the big city of Bangkok ("Hangover Part II") or tourism, amazing beaches, and parties in Phuket. Having the opportunity to travel around different areas including big cities, ancient capitals, small villages, and beach resorts revealed different facets of the country. The people we met and learned more about really left the biggest impression on me though. 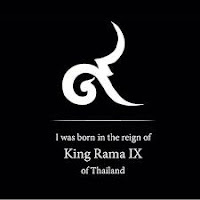 Nearly everywhere we traveled, they were extremely friendly and warm and expressed a strong sense of pride in their nation, the rich history of multiple kingdoms, Siam, and eventually what became the nation of Thailand. They also pride themselves as a free people who were never colonized by the European nations like many of the surrounding states. The opportunities to meet and interact with various tribes in the north such as the Hmong, Lisu, Karen, and Akha will not be soon forgotten. And most of all, we appreciated the incredible hospitality of our guides, hotel and restaurant employees, and all others who helped us during our trip. We LOVE our REI guides, Vicky, TK, and Anon. Left to Right in this video. Toasting with a Lisu Shaman and his village to the recent healing of one of their members. 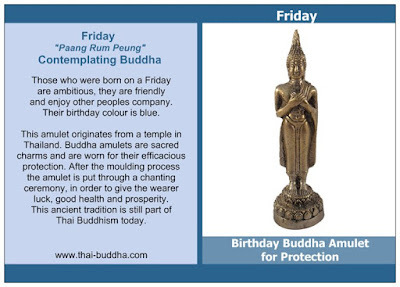 So what does a Monday birthday Buddha say?